The recent fast growth of our cities brought us new facets of alienation and anonymity – in sociological terms also known as ‘the lonely crowd’. Urban public spaces such as streets, parks and markets have a special role in the struggle against the dehumanisation of the post-industrial city. They are places of meeting and communication, an assemblage of moving pictures and are true indicators of the identity of a certain city and its inhabitants. Markets represent one of the oldest venues for the selling of goods and in particular, foodstuffs. Over history they’ve followed the development of socio-economic relations and have continuously – or not – enriched their offer, equipment and selling-styles. Markets grow spontaneously – where none exists a wild market forms and indicates the need to build one. They’re an anthill of different desires and possibilities, places with no fixed prices, with your favourite fresh tomatoes, exchanges of information, genuine relationships between the sellers and buyers, and a place that recognises little or no differentiation between rich and poor. Markets we find indoors and out, in the centre of the city or on the periphery. And there are the green, the eco, the grown and the raised, the old and new. It’s hard to imagine how Ljubljana would look if Jože Plečnik hadn’t given it such a strong stamp of representative buildings and regulations. Nor could we imagine not being able to sit under willows along the Ljubljanica river, nor buy fresh cheese and pastries at the Market with which to make burek. The Market offers a special visual and inner experience where you forget about time, space and supermarkets. It was built on the spot of the ancient city walls which were superseded by the colonnade by the Ljubljanica. Plečnik’s idea was to create a monumental and connected riverside space which would stretch between the Three Bridges and the Dragon Bridge. The composition begins with the little temple of the flower-shop. This is followed by an open colonnade with a balustrade on the river side and a semicircular balcony which conceals the spiral staircase leading down to the fish market. In order to provide the necessary views of the river the architect interrupted it with two open-columned loggias. The monumental covered Butchers’ Bridge was supposed to have stood in a gap somewhere halfway along the Market but the realisation of the bridge was interrupted by the WWII; the Market was completely renovated in 1994-95. Zeleni venac (trans: green wreath) is an urban neighbourhood of Belgrade that was build in the area previously part of the trench which surrounded the Kalemegdan fortress in the 18th century. What makes Zeleni Venac known today is the open market of the same name, one of the largest and oldest in Belgrade. It was first mentioned in 1885 when the government of the city decided that Zeleni venac would become one of the 7 cab-stands. In 1918 the first assembly of greengrocers was held on this spot. It was built in 1926 as a project of Viktor Gros. Back then it was one of the most contemporary markets and was called the queen of the markets. In 2005 city architect Ðorðe Bobić started to reconstruct it, with the opening in early 2007. The communal infrastructure has been completely renewed. In spite of (or because of) its freshness and newness the market looks somehow too tidy and too organized for the chaotic spirit of Belgrade. Heading south-west from Kálvin tér to Vámház körút, we come across the largest of five market halls opened towards the end of the 19th century – the Central Market Hall. Entering the market through the main entrance, knowing which way to turn is difficult, for all the colourful booths and tempting meats and produce immediately seduce. Perhaps it’s best to begin in the basement, where you can taste Hungary’s famous pickled vegetables and visit the oriental stores. This grand structure originally incorporated an indoor canal by which goods were delivered to the market’s traders. The sheer size and grandeur of the hall reflects an era when Budapest was a city with big ideas. After the design competition for a new market hall was announced in 1892, nine entries were submitted. The jury commissioned architect Samu Pecz for the implementation of the project. Several famous industrialists of the time were involved in the construction of the imposing building. The coloured ceramic components were made by the Vilmos Zsolnay ceramic company, which was famous throughout Europe. 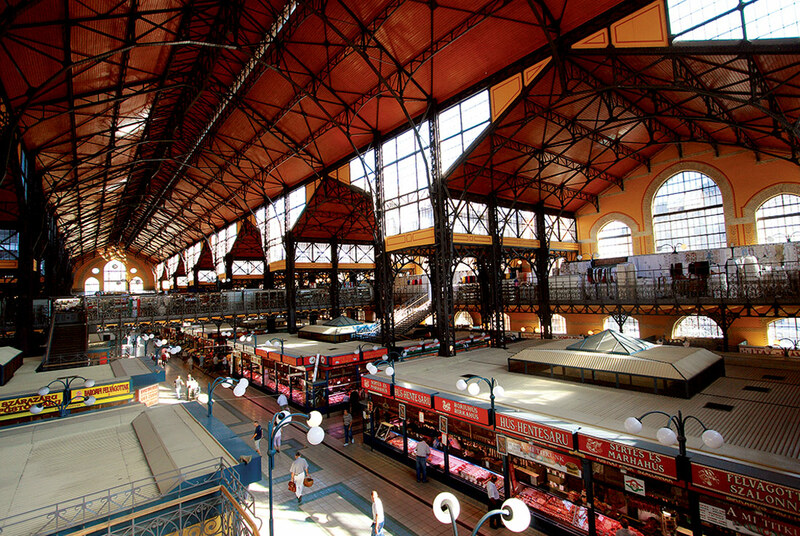 Renovations were finished in 1994 and the market hall once again became one of the most prestigious buildings of Budapest. In 1999, it won the most prestigious international prize of the architectural world, the FIABCI Prix d’Excellence. Markale grew out the need to unify the city’s food trade which intensified after the construction of the train station. The project called ‘Markthalle fur Sarajevo’ was designed in 1894 and the building was finished a year later. The architect of the building remains a mystery but the solution of the front facade is reminiscent of the projects of Josip Vancaš. Markale was built in the neo-renaissance style and is one of the most valuable realizations of its kind. The latticed structure of the cope and the cooler in the basement represent a contemporary approach in creating interesting, fluid interior space. Just a few hundred metres away is an open-air market with an unmistakeable yellow roof structure. The appearance and offer of this market is well suited to the lifestyle and character of the enigmatic ‘Sarajlija’ or Sarajevo local.